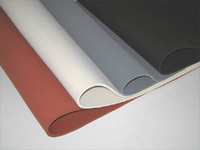 Nitrile Rubber is a copolymer of butadiene and acrylonitrile. Nitrile rubber sheets are mainly used as oil & solvent resistance as it has good tensile strength, low compression set, flexibility & impermeability to gases. These sheets are very good resistance to petroleum based products having recommended for operating temperature from (-20°C to +110°C). These sheets / rolls are mainly used for sealing, gasket & packing to avoid leakages from oil, solvent, petroleum based fluids, lubricating oil, transformer fluid & sealing against gases.. Very good resistance to petroleum based fluid goods & high temperature resistance up to 110°C. Very low-level permeability to gases. Poor ozone resistance. Store according to DIN 7716 standards. Products must be stored in cool, dry places with temperature ranging between 10°C to 30°C, sheltered from the sun & free from ozone for better shelf life. Avoid contact with acids & alkalies. 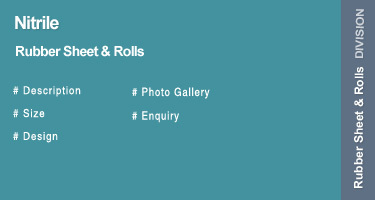 If there is any doubt about the condition of sheet/roll, they should be retested before putting into service. Products should be issued in the order of their date of manufacture. Optimized for 1280 x 960 and above resolution.